Overall Size: 9 3/16"" x 13"", Check Size: 3 1/8"" x 8 1/8"", Stub Size: 3 1/8"" x 4 7/8""
Order business checks and everything else you need to start keeping track of your company's financial records. When you choose our General Disbursement Check Kit - you get it all at once! 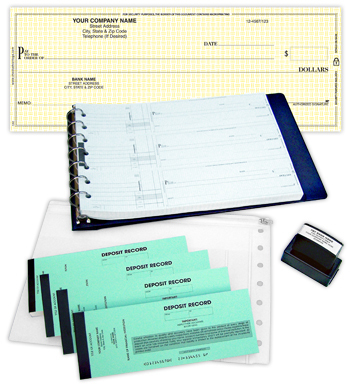 Resourceful business professionals will recognize how this business check kit can be a major time-saver! It is ideal for accounts payable or petty cash expenses. You'll receive a stash of our most popular manual business checks, a hard-to-find 7-ring check binder, and a pre-inked endorsement stamp personalized for your company! This is a deal you don't want to pass up, especially if you're just starting your own business. Order your General Disbursement Check Kit now and let CheckAdvantage give your business a boost of efficiency!